politicalbetting.com » Blog Archive » How do the blues and reds deal with Cleggmania? How do the blues and reds deal with Cleggmania? Should the Tories play the immigration card? With the reverberations of the post-debate opinion polls dominating the political coverage there’s a lot of focus this morning on how Labour and the Tories deal with the new challenge. But Rawnsley goes on to argue that the recent polling could change everything: “…. If that dynamic shift in allegiances is sustained, if the Lib Dems become the party with all the momentum, who knows what might happen? If there are confirmatory polls placing Labour in third place, then everyone in Gordon Brown’s bunker will need a change of trousers…..
As they also will at Tory HQ where their ambitions to win a majority now greatly depend on finding a way of putting the lid on the Lib Dems. David Cameron’s strategists are already arguing among themselves about how aggressively they should “take the fight” to Nick Clegg. 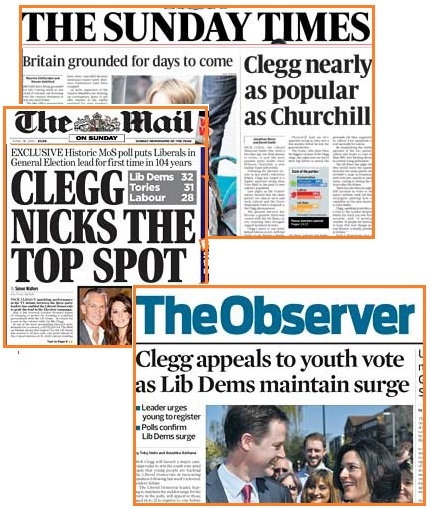 For most of David Cameron’s leadership, his approach has been to try to hug the Lib Dems to death. The Lib Dem leader disdained the Tory’s attempts to love bomb him during the first debate. Influential voices around David Cameron are telling him to forget any more loving and concentrate on bombing. Their visceral instinct is to go for the Lib Dems as wet on crime, reckless on defence, soft on immigration and in love with Europe. The first signs of the Tory response, an email to supporters from George Osborne, suggests that immigration might be the line of attack, particularly the Lib Dem call for an amnesty for illegal immigrants. Trouble is that this is something Boris has suggested in the past. Eighteen days to go – who knows where we will end up?